I also created a Card Rack shape that automatically drops four playing cards into it when you drag and drop it on the page. The Legend shape is the Microsoft one, and it will display the number of cards dropped onto the page that it is placed on. Alternatively, the right-mouse menu of the card shape provides the ability to change most of the Shape Data, and features some nice suit icons to boot! 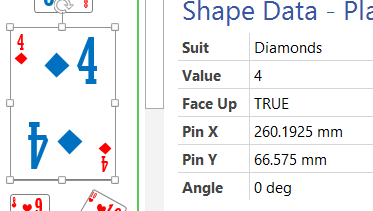 You can select a bank of cards together and change their shape data, such as Face Up, all in one go. 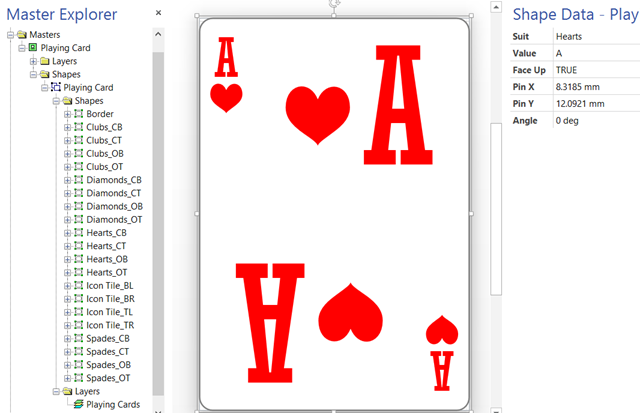 These playing cards were automatically laid out from the linked data recordset in the accompanying Visio document. The alternative colors for the sight impaired can be displayed with the simple change of a page shape data value. Now that I had a playing card shape that I am happy with, then I could start playing with how to use it! So, I used the RAND() ShapeSheet function to generate a random number between 0 and 51, and then I converted this into one of the suit and values. 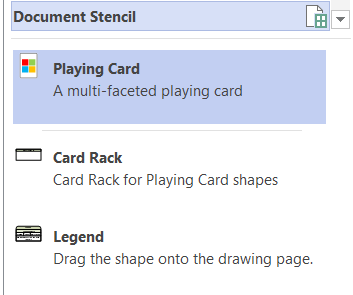 These User-defined cell formulas provide the ability to drop a playing card with a randomly generated value onto the page, or I can use the Card Rack shape to automatically drop four cards, then insert more afterwards. All I need now is to create a game with these cards … apart from Snap when the RAND() function provides the same card again!